Other names: Canton lemon, Kona lime, Kusai lime, mandarin lime, cravo lemon, marmalade orange, surkh nimbu, Sylhet lime. Often called a mandarin lime or local lemon in Hawaii, the fruit is a naturally occurring hybrid between lemon and mandarin orange (tangerine). A medium sized citrus tree often confused with a tangerine or other citrus on first glance. The fruit is polyembryonic and usually reproduces true to seed. A popular rootstock in many citrus growing locations, the tree evolved in Hawaii as an ornamental, often when the top graft died off. The spreading and drooping branches have dull green foliage with an occasional purple tint on new growth. It can reach a height of 20 feet. Numbers and size of thorns vary from tree to tree with some trees being almost thornless. The fruit rind is orange to reddish orange with minutely pitted moderately loose skin with oil glands and a lime like aroma. Highly acidic and very juicy, the fruit has 8 to 10 segments with numerous seeds and is slightly hollow in the center. Rangpur lime is reportedly introduced to Hawaii in the 1880s, the fruit has acclimated to Hawaii’s volcanic well drained soil. Having been used for culinary purposes since the early 1920s, the trees have been maintained for their fruit rather than their use as a rootstock. The juice from the fruit has also been used for cleaning dishes and glass. With the possible exception of India, which exports Rangpur lime marmalade to England, the fruit has found a growing following on the Big Island and arguably deserves to be called Kona lime. 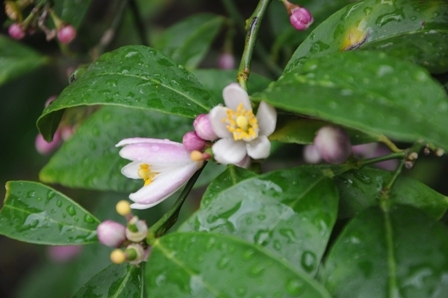 Further selection work to determine specific cultivars for Hawaii is recommended. There are few reported cultivars of Rangpur as most trees are produced from seed. There are occasional differences in the color and nature of the rind, numbers of seeds and the amount and size of thorns. There are two other mandarin limes often categorized with Rangpur, the kusaie lime, a yellow colored highly acidic form of the Rangpur and the Otaheite Rangpur, an acidless form of the fruit. ‘Citrolima’, is a cultivar with larger leaves and vigorous growth often used in Brazil as a rootstock for Valencia oranges. The Rangpur, as with most citrus, prefers well-drained soil. In the Kona district the tree is found from sea level to 3000-foot elevation. It is tolerant of colder areas and should do well at much higher elevations given sufficient rainfall and nutrition. Spacing is consistent with other citrus, usually planted 15 to 20 feet apart or about 100 trees per acre. Seedlings will produce fruit in 4 to 6 years reaching full production in 7 to 10 years. The trees can be grown and will fruit in pots. When root bound in large tubs, they will naturally dwarf. The tree is more tolerant of salt and high pH than many citrus. It is resistant to a number of diseases making it the rootstock of choice in large citrus producing areas in Brazil. The tree requires irrigation in periods of extended drought but will not tolerate being waterlogged. Young trees are pruned to establish shape, which facilitates harvesting and increases yields on mature trees. Annual pruning to maintain a desired height of 6 to 8 feet and to thin new growth and remove dead wood is advisable. Increased yields can be obtained by pruning to open the trees interior to light and air circulation. Flowering and fruiting occurs on 2-year growth. A common problem for most citrus in Hawaii is the citrus leafminer, Phyllocnistis citrella Stainton. Damage to new growth and developing fruit can be extensive with the insect tunneling just under the surface of the leaves or skin of the fruit. Control of the leafminer by a parasitic wasp, also found in Hawaii, Ageniaspis citricola Logvinovskaya, helps minimize damage. Spiders, flower bug, Orius insidiosus, ladybugs, fire ants and the lacewing, Chrysoperla rufilabris also help to keep the leafminer in check. Petroleum sprays help to inhibit egg laying but need to be repeated every 2 weeks when the plant flushes. Foot rot and root rot from Phytophthora sp can be a problem with Rangpur. Good soil drainage is important to prevent rot from occurring. Over watering and wetting of the trunk will promote the spread of this fungus. Citrus black fly, Aleurocanthus woglumi Ashby, damage citrus trees by sucking the sap, which removes water and nutrients. The excretion is small droplets of honeydew on which grows the sooty mold fungus. The sooty mold causes a reduction of photosynthesis that causes a general decline of plant health and reduction of fruiting. Parasitic wasps were released in 2000, which have helped to control the pest. Neem oil and other sprays help to limit infestation. Once a tree is infected it is important to make sure it has enough water and additional fertilizer to replenish lost nutrients. Fruit flies are not a major problem for the Rangpur Kona Lime but it is advisable to follow the Hawaii Areawide Fruit Fly Pest Management Program (HAW-FLYPM). Citrus tristeza virus is not a major problem for the Rangpur Kona lime as it is naturally resistant. 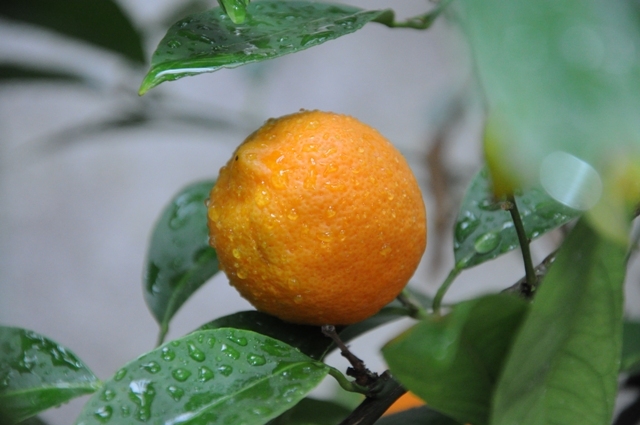 Other resistant root stocks like the mandarin ‘Heen Naran, ’ or ‘Cleopatra’ can be used for the lime or other citrus. The Rangpur lime tree is generally propagated by seed but can be grafted. Trees with few thorns or those that are especially prolific producers can be grafted onto a rangpur or other citrus rootstock like the rough skinned lemon, ‘Citrus jambhiri’, ‘Heen Naran’ or trifoliate orange, Poncirus trifoliata Raf. Rangpur can co-exist with other citrus on the same rootstock. On a South Kona tree, Rangpur lime, Meyer lemon, and tangelo all produce fruit on the same tree. The fruit is harvested when orange colored. A mature 7-foot well-pruned tree can produce 100 fruit or more per season and yield an average of 50 pounds of fruit. Older trees that have not been pruned can yield 300 to 400 fruit but harvesting is difficult and time consuming due the excessive height and numerous thorns. As with most citrus, Rangpur limes can be stored from 36 to 39 degrees F. for up to 5 months. A wax coating will lengthen the time they can be stored, often up to 10 months. Frozen juice can be stored for future use. The two project Rangpur lime trees produced an average annual marketable yield of 83.1 pounds. The average market price was $0.60 per pound, and therefore the trees generated gross revenue of $99.75 for the year. Growing costs (fertilization, irrigation, pruning and all weed and pest control) amounted to $80.26, and harvesting costs (picking, packing and delivery to market) totaled $23.06. (All labor to grow and harvest the Rangpur limes was assumed to be paid at an hourly wage rate of $16.00, including withholding, FICA and benefits.) Thus, the total annual operating costs, sometimes referred to as “variable costs,” were $103.32. The gross margin (gross revenue minus all operating costs) was a negative $3.57. The Rangpur lime gross margin is the amount of money available to pay all the ownership costs associated with the Rangpur lime enterprise. Ownership costs, sometimes referred to as “fixed costs,” include the value of land used (rent or rent equivalent or mortgage and property taxes), the value of the capital investment (such as the tree establishment cost and buildings and vehicles), the value of the management, and the value of any unpaid labor. (All paid labor is already included in the gross margin.) Ownership costs, unlike operating costs, will vary substantially from farm to farm and will depend largely on how the farming operation is financed and on economies of scale. Each grower will have to calculate his total farm ownership costs and then allocate an appropriate portion of these costs to each enterprise on the farm. Now the profitability of the Rangpur lime enterprise can be determined by subtracting the Rangpur lime enterprise’s share of the total ownership costs from the gross margin for Rangpur limes. The cost and return data are what was obtained from the 12 Trees Project site and other locations. Yields and costs were based on optimal growing conditions for one or more trees at various locations; different results will be obtained under different growing conditions. The prices used were actually obtained in 2005 and 2006. There is no guarantee that these prices will continue, especially if production increases significantly. These costs and returns are simply a starting point for growers to make their own estimates. Fresh fruit sold to markets in South Kona are boxed in 10-pound packages and wholesaled for 50 cents per pound. 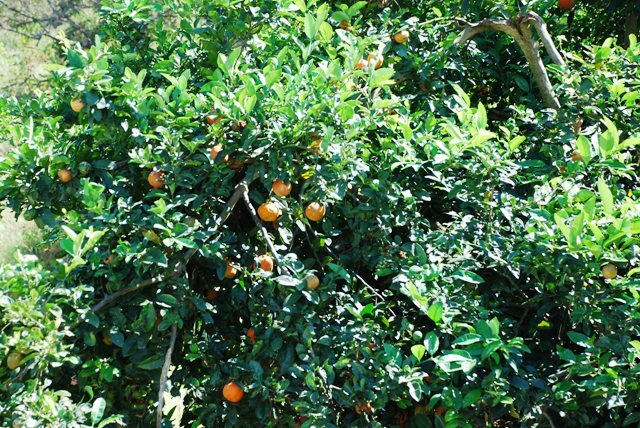 The markets found that consumers often confused the fruit with tangerines regardless of signage that promoted the unusual locally grown fruit. Packaging of 5 fruit in a vented plastic bag was then used. Hotels and restaurants order the fruit by weight, sometimes as much as 50 pounds at a time. Individual fruit, with an average weight of 7 ounces, are sold at farm stands for 50 cents each. In order to interest other hotel and restaurant chefs in the fruit, samples were sent to 10 Big Island chefs who had not previously ordered the fruit from wholesalers. Sample recipes created by students at the Hawaii Community College West Hawaii Culinary Arts Program as well as nutritional information were sent with the fruit. Seven of the ten chefs have continued to order the fruit for a year after receiving the first samples. Health benefits– All citrus contain healthy amounts of Vitamin C that helps to manufacture the body’s collagen that helps heal cuts or wounds. The zest from limes and other citrus also contains compounds that can block cancerous cell changes. Limonene in the zest can increase the level of liver enzymes that fight cancer-causing chemicals. The author is grateful to Drs. R. Bowen, B. Brunner, K Fleming, R. Paull and F. Zee for their valuable contributions to this manuscript.